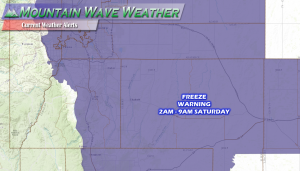 The National Weather Service in Denver has issued a Freeze Warning for much of the Colorado front range including the Palmer Divide in areas West of the foothills. Here’s a quick look at what this warning means and how to prepare for it. What Does A Freeze Warning Mean? A Freeze Warning is issued when sub-freezing temperatures are imminent or highly likely. These conditions will kill crops and other sensitive vegetation. Latest model guidance is a bit all over the place with nailing down the temperatures but if you take the mean of most big models you end up with temperatures in the mid to upper 20’s by Saturday morning. Hard Freeze conditions may not exist terribly long but the possibility is there. Models are fairly confident on at least a few hours of sub-freezing temperatures into Saturday morning. Cover any sensitive plants. Blankets or even a cardboard box will do. Anything that keeps that actual cold air from effecting the plants works well. Any above-ground sprinkler system equipment should be at the very least covered but I’d recommend draining as well. Colder air may sink into some of the lower areas of Castle Rock (think low points of Meadows and Downtown Castle Rock near Plum Creek.) and trend temperatures a few degrees colder. We’ll have another post up later today with snowfall amounts from our past storm and a storm recap. Stay tuned!